It’s finally feeling summery here! We’re coming off a weekend of lots of outdoor time, including a great strawberry festival, and finishing up the planting of our garden. It only seemed fitting to prep ahead for the week with a hearty salad. We’re loving this fresh vegan version of a classic Niçoise salad. It features Nasoya Toss’ables Garlic & Herb baked tofu, buttery boiled potatoes, blanched green beans, kalamata olives, capers, and tomatoes with a white wine Dijon vinaigrette. You can prep ahead to make this salad come together in less than 10 minutes by batch cooking the potatoes and greens beans, and mixing the dressing ahead of time. It’s hearty enough for lunch or dinner, and there are endless options for add-ins and swaps (see recipe variation suggestions below!). Disclosure: This recipe was created as an entry for a contest with Nasoya. We were not compensated for creating this post but received product samples in order to test the product and are eligible to win a prize. All opinions are our own. 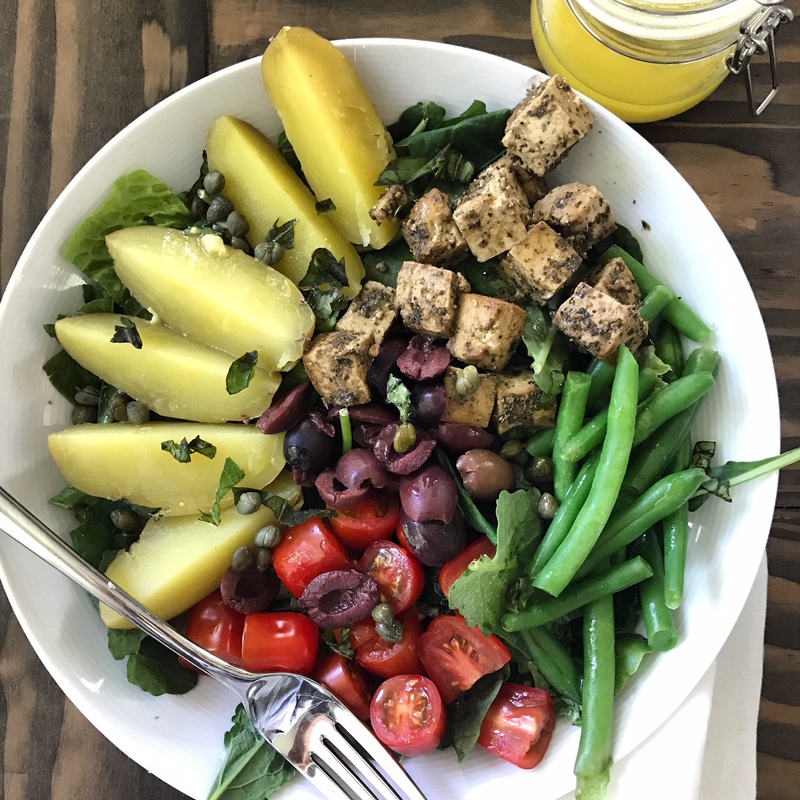 A vegan version of a classic Niçoise salad featuring Nasoya Toss'ables Garlic & Herb baked tofu, buttery boiled potatoes, blanched green beans, kalamata olives, capers, and tomatoes with a white wine Dijon vinaigrette. Place the greens to a large shallow salad bowl, then arrange the remaining ingredients over the top. Add the dressing ingredients to a jar with a lid and shake until well combined (or use a bowl and whisk together). Dress the salad with 2 tablespoons of dressing, or to taste. Refrigerate the remaining dressing and store in an airtight container for up to one week.